Photo provided by Miles Altman. Twenty-five feet below the surface, a marauding school of bull reds swept the sandy bottom out away from Hilton Head’s beautiful beaches in search of prey. Honing in on the smell of fresh-cut mullet, a large bull inhaled the chunk, and upon feeling the bite of the 8/0 circle hook, put its broad shoulders and tail into high gear. Above the surface on board the Phantom, a medium heavy-spinning rod bucked and then bent double as the reel drag started singing that song all anglers love to hear—the line disappearing off the spool at a high rate. One of the bright spots in our local fisheries is the impressive comeback of the red drum. Years of tight restrictions on bag limits and increased mariculture efforts by the state have resulted in one of our most prolific fisheries. 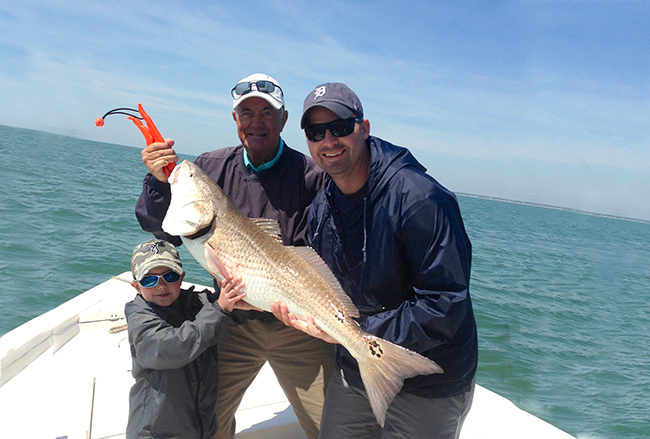 Known by many names—spottail bass, redfish (smaller ones) and bull reds (bigger ones)—red drum offer some of the best sport fishing for Lowcountry anglers regardless of whether they are land bound or boaters. They get their name because male redfish produce drumming sounds using muscular contractions, which rub against their swim bladder, to attract females. 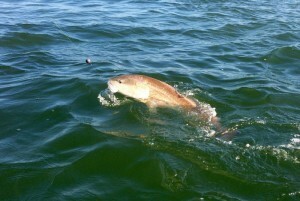 Bull reds make two strong runs a year: April and usually September/October. During these times catching double-digit numbers of 20- to 40-pounders is not uncommon. An occasional bull can be caught anytime of the year—the smaller ones are here all year long—but it’s nothing compared to the spring and fall. Shrimp, small crabs, and finger mullet are common forage for the redfish and therefore make excellent bait. Several artificial lures work well when trying to catch redfish, including spoons, spinner baits and jigs. Spinning or baitcasting gear, 10- to 20-pound rating and a 1/0 to 4/0 hook will suffice for tackle. On the Phantom, I like to use medium heavy spinning rods with 40-pound braid. I fish a fairly tight drag, letting the battle wear on with lighter stuff. This increases the recovery time and the mortality of the release fish. Multiple hookups are fairly common, creating a Chinese fire drill on board as anglers strive to keep the strong fish from tangling. It’s great fishing the big bull reds and the time is now. Written by Captain Miles Altman of Bayrunner Fishing Charters, who has more than 42 years experience fishing the waters surrounding Hilton Head Island. Don’t miss the new “Finatic” boat, which can accommodate up to 12 passengers and features a special three-hour shark/dolphin eco-tour trip. Contact Miles at (843) 290-6955 to book an unforgettable inshore or offshore charter fishing trip, departing from Shelter Cove Marina.